Is Maxis working on a game with the most customizable hero in history? Maxis, creator of Sim City and The Sims, will reveal its new game at San Diego Comic Con later this month. The game is described as a "Sci-Fi Action-RPG based on the DNA of Spore" and will be unveiled by key leads from the design team in an hour long session on July 24th. Exactly what is meant by "the DNA of Spore" isn't clear. 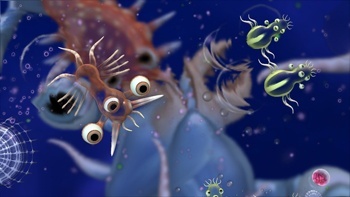 It might mean that the game is a spin-off title like Spore Hero for the Wii, or it might mean that the game uses some of Spore's systems, like the creature creator. There's a lot of very cool games that could come from this, from a Zelda-style game where the treasures are wings and feet rather than bows and boomerangs, to a game where you can walk into Mos Eisley-esque cantina as a species you designed yourself. Whatever the connection is though, we're going to have to wait a couple of weeks to find out.